The Super Bowl gives companies a platform for advertising that is unlike any other. With the largest crowd of the year watching this one event companies pay more money each year for the right to advertise during this game even if it’s only a spot that takes up thirty seconds of time. The visibility for this one spot is a great way for companies to show off new products which is one reason why so many car companies are advertised during this big game. It probably doesn’t hurt that car companies make more money than most other industries as well to have the advertising budgets to handle the cost of multiple spots. With that in mind, here is what we saw during Super Bowl 50. Acura – The new NSX made its way to the center stage in an ad that featured the car as a hot rodding show-stopping sports car that would give us the awesome performance we want to enjoy. With the right music in the background, this was one exciting and loud commercial to get our thoughts racing of what it would be like to drive this awesome new sports car from the Honda luxury line. Audi – Not to be outdone by Acura, Audi pulled at our heartstrings as the retired astronaut “Commander” was given the keys to a new Audi R8 and got the chance to have an exciting ride in a car that was only outdone by the rocket he used to command into space. This is certainly a commercial that brought some tears to our eyes as we knew this man gave his younger years for the chance to reach new places for his country and then was left to retire quietly, at least his son knew what he needed to cure the depression he was feeling. Buick – As the newest product from Buick the Cascada comes in a convertible style and this add is set at a wedding where the lucky lady who catches the bouquet does so in true “Odell” style. So many agree she made a great grab except for OBJ himself who says she is out of bounds. What does this have to do with Buick? Most of the party can’t believe she “Odell’d” the bouquet while the wedding party can’t believe the car is a Buick with the Cascada being the choice of the bride and groom to exit the scene in. Honda – The new Ridgeline makes its debut in the Super Bowl ads accompanied by a group of singing sheep who give us their rendition of a famous Queen song. This is certainly entertaining and lets us admire the in bed audio system which makes this a great truck for continued entertainment outside of the cab and for tailgating. The truck does look more like a typical truck now and offers not only the audio system in the bed but what appears to be a trunk under the bed floor. Hyundai – Hyundai brought in two commercials for the Elantra. In one of them, we see a couple escaping what appears to be a pair of hungry grizzly bears. They are able to escape because the car is remote stated from his wrist watch phone app. At the end of this ad, we learn the bears can talk and just wanted to hug the people. In the second ad, the Elantra is driven through a town full of Ryan Reynolds’s to take the attention of the young woman driver off the road. This commercial shows us how the automatic braking works as the car stops to avoid yet another Ryan character who is walking his dogs. Hyundai did not stop with the Elantra. They next showed us an ad for the Genesis, which actually was shown just before the kickoff of the game. This ad featured Kevin Hart as an overprotective father who loaned his new Genesis to his daughter’s date and followed them throughout the date. Then there was the over the top showing of the new Vision G concept which we saw at the end of the commercial that showed a baby to a man who had an engine where his heart was supposed to be. Jeep – Tugging at our heartstrings once again, Jeep is celebrating its 75th anniversary and shows us a wide range of those who have been veterans and celebrities in their portrait commercial that gave us sweet memories of a variety of great faces and Jeep models that reach back to the beginning of the brand with the original GP vehicles. We also got to see the 4X4 commercial which shows us we want to be in the great outdoors with this brand which has been used for more off road trekking than any other. Jeep nailed their advertising this year during the Super Bowl commercials. Kia – Of course we can’t forget the Walken closet ad from Kia which features Christopher Walken in the walk-in closet to talk about the difference between plain and standing out. 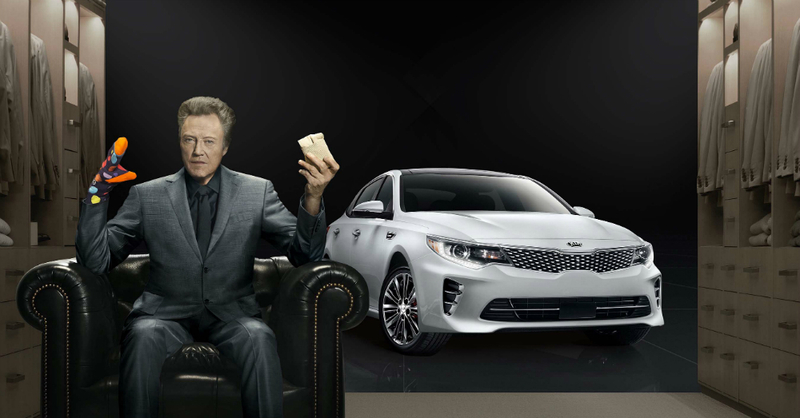 With a snap of the fingers, Walken shows us a Kia Optima that feels and looks great like a pair of exciting socks. The use of Walken in the closet and the excitement of the new Optima makes for one amazing commercial that was a lot of fun to watch with a few laughs and the admiration of the new Optima. Mini – Here you have a label-defying car that comes in the form of the Mini Clubman which is a new SUV from Mini that shows us that the Clubman is not going to be labeled anything ordinary. There is no doubt this is a car that won’t be defined and each actor in the commercial, which features Harvey Keitel, Tony Hawk, Abby Wambach, T-Pain, Serena Williams and Randy Johnson, have their own take on what this car is not to let us see the labels won’t fit this car no matter how hard we try. Toyota – With two ads (actually three if you count the continuation add after the game was over) all to talk about the new Prius we are told the Prius is “badass” and a car that can give the performance and keep on driving much longer than most of the other cars on the road. With a full crowd of what appears to be your typical office team who have donned instruments, this first offering was a lot of fun. The second offering is a quartet of bank robbers who gain a great following in the world who loves the car that is not only outrunning the police, but can keep going when the cops are out of gas and out of power.